In her early childhood, Helen learns of the prophecies that will shape her life. That she will be the most beautiful woman in the world. That she will bring death to many Greeks. That she will leave her husband for another. Her parents think they can avoid the last two, by having her many suitors swear oaths to honour and protect the marriage and by having Helen choose her husband herself. Helen chooses Menelaus, who sees her as something more than the legend of her beauty. But she finds no passion in the marriage. She tells herself that she can live without passion, until Paris, prince of Troy walks into her life. 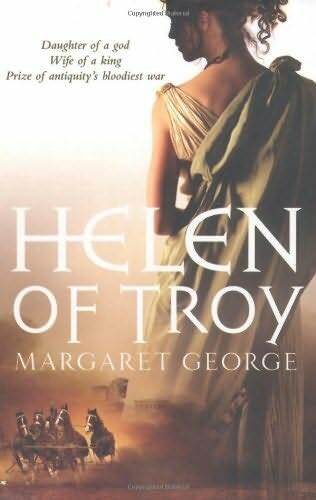 And, not to reveal too much about a myth I think everyone knows, in fleeing with Paris back to Troy, Helen fulfills the worst of the prophecies, bringing death to both Greeks and Trojans. To embrace myth or history? The author pretty much asks the same question in her afterword. I will admit that my personal bias is toward history, so I didn't like that the book leaned more toward the myth side. By that, I don't mean that I dislike that the novel followed pretty much the story of Helen (except one odd exclusion at the beginning), but that the Gods seemed to be actual characters that played too pivotal a role. For me, one of the most important part about the story of Helen and Paris - in a movie or in a book - is that I need to believe that there was something between them that would make Helen risk everything to go with him back to Troy. Actually, even if some author just wanted to make it that her life with Menelaus was so horrible and that she was running away from this horror, that could work too. But in this novel, she was content enough with her life with Menelaus. It was only because Aphrodite cursed her and Paris that they fell in love/lust with each other. They barely spoke to each other before leaving together. I needed more than that. The story of Troy is so rich and detailed, but I don't think that the author made it her own. There seemed to be a lack of substance in her characterizations - and given the novel (at least the version I read) was over 600 pages, that's a problem. I wasn't sympathetic to Helen or Paris. The Greeks, for the most part, were just names on a page because the story is told from Helen's point of view entirely. I was disappointed with the end, especially the resolution about Helen's relationship with her daughter. I am always a little disappointed with novels about Troy where Achilles and Patroclus are not lovers. Side note, that is more of a general comment about all novels about Troy I have read and not just this one, but I find it odd that you have characters like Menelaus, Helen, Paris and Achilles that can sometimes be portrayed negatively, but also have sympathetic portrayals (I can't think of a Menelaus example off the top of my head, but I am sure I have read one), but that Agamemnon is always written in a negative light. I wish I could find a novel where he has a more sympathetic portrayal. On the whole, this was a book that was difficult to get through. I was quite disappointed with it, which made me not want to pick it up a lot of times. But because I like the story of Troy so much, I can't really grade it any lower than a C.